Last month smalls nominated you as Featured Skater. She wants to know what your goals are for this season. My goals for this season…I guess the most basic goal is to be a skater that can positively contribute during our bouts, whether I’m rostered on the A or B team. And also be someone that positively contributes to the growth of everyone around me in our practices. Everyone has a different origin story: What brought you to roller derby in the first place? Well, there was a skater who used to be on Hard Knox that went by Queen Beatdown. We met at my first appointment at Planned Parenthood when I came out as trans in the summer of 2016 and we were chatting about life in general, and it came up that I used to play ice hockey. 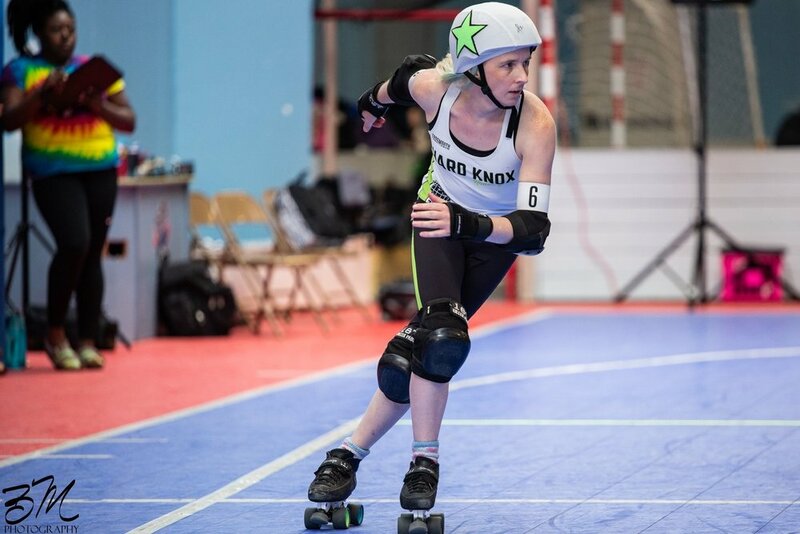 She was like, “I used to skate with the Hard Knox Roller Girls. You should totally go try out with them.” I had a lot on my plate back then, getting into local LGBT activism, and couldn’t make the time commitment. Two years had passed, and it was always in the back of my head. I started seeing posts on social media for the Fresh Meat classes in the winter/spring of 2018. I signed up, and I guess the rest is history. That was a perfect transition to my next question: Tell me about your sports background, and how does derby compare to those sports? What skills are you finding similar and useful? Oh, gosh. My sports background goes back 30 years. I have been an athlete my whole life. I guess that is something that has attributed to my fast progression in derby. I started off when I was 5 years old on a soccer team. From there, I played soccer, I played baseball…Baseball took up the greatest portion of my life up to my teenage years. Then I started track and field, focusing on sprinting and jumping events. My specialties were 110 meter hurdles and discus. Which explains why you are so good at jumping. Yeah, jumping and sprinting events are what I primarily participated in. I even played golf for a while which is a little embarrassing. The skating background comes in when I started playing ice and inline skating hockey. That was about 6 years before I started derby. Of course, playing sports for that long, I have been in team environments. More important than the physical aspect of all these sports I have played, is the mental side of things. Having a mind that quickly learns the rules, that sense of urgency, and the “sports IQ” are some of the things that are often overlooked when we are training. People focus on raw skills, but those skills won’t be as useful if you don’t have the mindset to use them. That is the most important thing I have gained from participating in sports for over 30 years. What are some of your highlights from your first season? Making the team. I remember when I was in the 2nd Fresh Meat class and we were watching everyone on the team practice. I was watching people like Pinion and Val out there skating, and I was thinking, “There is no way that I have a chance of making this team: look at these people skate.” But, I kept at it. I would go to the Fresh Meat classes, I would go to the skating rink, and go to the skate park. I just wanted so badly to be on the team. Then when it came test time, I was calm. I had no nerves or anything. I was like, “I can do it,” and I did it. Being on the team has been very important to me, too, since 2018 was a year full of a lot of loss for me that I am still recovering from. Having people around me; it is a new family for me that I feel I am a part of. That has been the most important thing for me. Do you have any derby heroes and where do you find your inspiration? Well, when I signed up for Fresh Meat, I immediately started reading about derby, watching videos, etc. Even before the first Fresh Meat class occurred, I was in research mode. One of the first skaters I came across was Miracle Whips. She is my absolute favorite skater. One of the highlights of this season was actually getting to meet her multiple times. Getting to skate with her at a clinic and learn from her and also becoming friends with her and a lot of the other folks from the New Skids was a complete shock to me. I am going up to Montreal this month to skate with them for 2 days. I didn’t think anything like that would happen being so new to derby. I have met so many amazing skaters at the top level like Freight Train, Lady Trample, Honey Badger, a lot of the folks on Atlanta Roller Derby…everyone has just been so great. I am so thankful for how kind everyone has been. Do you have a preferred position? Jammer all the way. I have always been very “offensive minded”. In hockey, I played center. Being a center, you have to be a 2 way player, but I loved the offensive side of it. In roller derby my mind is certainly geared more toward offense: how to break up the opposing team’s packs. I am constantly analyzing, looking for that optimal line, where to give that burst, where to take that risk to get around them and get that lead jammer status. When it comes to the blocking side of things, I feel a little lost. I am small, and I don’t have a lot of mass to push around. I’m not very effective at really stopping someone. I’m 5’4”, 120lbs. I feel the skills that this meat vessel has are more geared toward jamming and being quick, agile, and fast. I was feeling nostalgic the other day, thinking about cartoons and T.V. as a kid. I know we are about the same age. What were your favorite childhood cartoons or T.V. shows and why were they your favorite? Something that I always remember wanting to wake up early and watch was, as cheesy and lame as this is, The Super Mario Bros. Super Show!. I was a Nintendo kid, and that was my show. The animation was bad and they always liked to show the character talking with a different voice coming out. It was just awful, but it was enjoyable to me. And of course, Teenage Mutant Ninja Turtles was a staple. Mostly I spent my time playing my Nintendo. What do you do for fun when you aren’t on skates? I’m a musician and have been a musician for a long time. That’s what really helped me get through my teenage years by being alone in my bedroom just playing my guitar. It gave me a voice when I felt I did not have one. 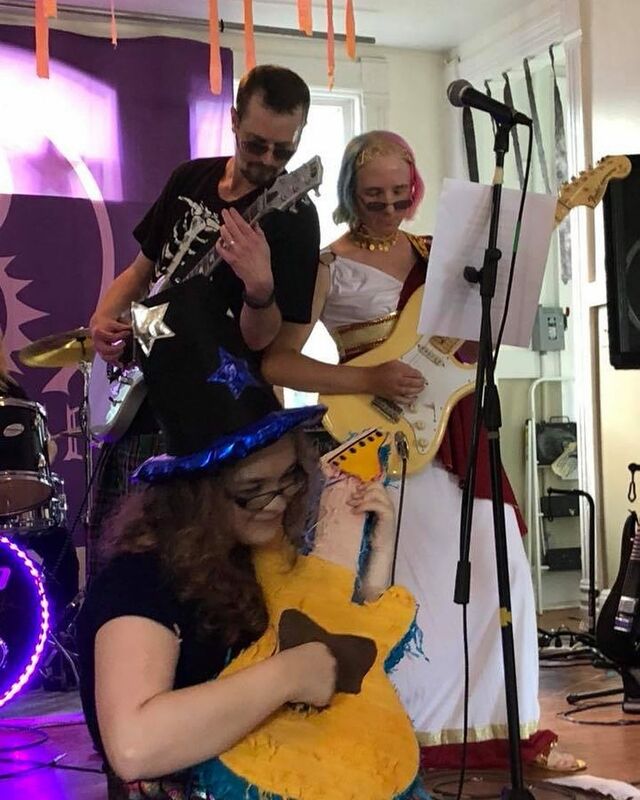 I am currently lead guitarist and composer in a band called Gay Wizards. Beyond that, I do still play video games occasionally. I also just spend a lot of time reading about things. I am a big non-fiction reader. I am that nerdy person that asks people in academia to send me actual papers that have been published in journals. I want to read those. Yes. And then read articles ancillary to those topics to contextualize. I like to analyze if my understanding of the paper is accurate compared to those that write about the topic being cited. And on the professional side of things, I have to read things that are engineering related because I am a software engineer by trade. I am just a huge nerd. The boot is Mota Savage. I have the Sure-Grip Avenger plates. I have been teetering between Bionic and Gumball toe stops. I have been a cheapskate on my bearings: I still have Bones Super REDS. I have been reading articles about the ceramic versus non-ceramic bearings being put under stress tests. A lot of the things you read about bearings often mention an ABEC rating, and that is geared more toward machinery, not skating. That is a rating for under a machine load, not a skater load. Which is completely different. It is not an apt comparison, so that rating is essentially useless when it comes to skating. There have been some people trying to do actual scientific tests in regards to ceramic for the price versus steel bearings. I’m still teetering back and forth on that. The price is significantly different. Yes, but it’s also like, how often do I change my bearing versus a ceramic bearing that will potentially last longer. Who would you like to nominate as the next featured skater, and what would you like to ask them? I would like to nominate my derby sister for life from my Fresh Meat class, Meryl Kreep. I want to know all the things: I want to know how she got into derby; I want to know what all of her goals are; I want to tell her how proud I am of her for how awesome she is doing and that I am excited we get to skate together on possibly the A and B team this year. I am so thankful for her being by my side last year.